What are lingerie accessories you ask? I'm not talking about adding on a matching suspender belt or hosiery and calling it an accessory. That's just lingerie. I'm talking about accessories like wearing earrings that compliment the colour of your dress. Not necessary, but adds a little something to your outfit. Something you would wear to dress things up. Lingerie accessories are a little different to clothing accessories. Yes you can go and put on those lovely filigree lace look earrings to go with your lacy lingerie set, but I'm thinking outside the box here. How about a lace mask? Italian label Naory (pictured here) made a gorgeous series "Lulu" with a matching lace mask. These pieces completely sold out before I could get my hands on them........ Such a shame. 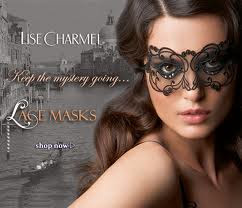 However I did start a collection of Lise Charmel (French Label sold at im) lace masks. They were $55 a mask. And they each match a lingerie series released by the company. I unfortunately only have one of the matching series. They release a lace mask each season. I'm eagerly awaiting the next release! How about some hand cuffs?? Now I'm not talking about the tacky fur lined cheap metal cuffs bought at a Club X store. I'm talking pretty lace style cuffs with ribbon ties you could actually wear out as a fashion accessory. Lately I have found quite a few international labels creating them to compliment a lingerie set. How gorgeous! Remember this is all in fun. Here are a few look ideas for those adventurous enough to try some lingerie accessories. So now what do you think of lingerie accessories?